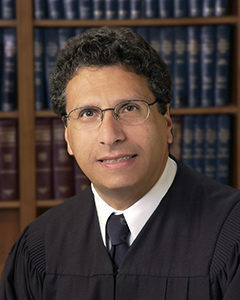 Honorable George J. Abdallah, Jr.
Judge Abdallah was appointed by the Supreme Court as an initial CJEO member in 2009. He began his judicial career in 1987 as a commissioner for the San Joaquin County Municipal and Superior Courts. He was appointed to the San Joaquin County Municipal Court in 1995 and he joined the San Joaquin County Superior Court in 1998. Judge Abdallah served as presiding judge of both courts and his assignments have included criminal trials and major felonies, presiding judge of the appellate division, and supervisor of the civil and criminal grand juries. As a member of the California Judges Association, he has served as chair of the education and planning committee and as a lecturer. In addition to CJEO membership, Judge Abdallah’s judicial ethics experience includes serving as a special master for the Commission on Judicial Performance and on the Supreme Court Advisory Committee on the Code of Judicial Ethics. He has also served the judicial branch and the public as a member of the Judicial Council. Judge Abdallah teaches regularly for the Center for Judicial Education and Research and has served on its governing committee and lectured at Judicial College and New Judges Orientation. He has also been an adjunct professor at Humphreys School of Law and a guest lecturer at the University of the Pacific. In 2014, the California Senate honored Judge Abdallah for his contributions to the judicial system.